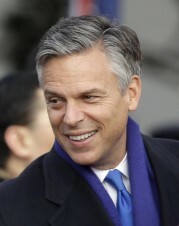 Jon Huntsman, a millionaire scion of the Huntsman chemical empire, is a former Utah governor who served as Barack Obama’s first ambassador to China and later as a candidate for the 2012 GOP presidential nomination. In 2017, Donald Trump appointed Huntsman ambassador to Russia. While Huntsman is often described as a centrist on foreign policy he has sought to distance himself from Democrats and pushed a hardline a numerous national security issues. A key focus has been promoting free trade deals, in contrast to the protectionist rhetoric of Donald Trump. He once criticized the Obama administration for stifling trade deals “unless the measures were coupled with expanded funding” for union-backed entitlement programs. Huntsman has pursued a hawkish stance on Iran’s nuclear program. “I cannot live with a nuclear-armed Iran,” he once said. “If you want an example of when I would use American force, it would be that.” After the Iran nuclear deal was concluded in 2015, Hunstman co-authered with John Lieberman a blistering criticism of the agreement. Team Huntsman, “Welcome to Jon Huntsman for President!,” jon2012.com, August 25, 2011, http://jon2012.com/blog/Aug-25-2011/Welcome-Jon-Huntsman-President. Jonathan Chait, “Jon Huntsman’s Long Game,” The New Republic, May 20, 2011, http://www.tnr.com/blog/jonathan-chait/88780/jon-huntsmans-long-game. Jon Huntsman, Twitter.com, August 18, 2011, https://twitter.com/#%21/JonHuntsman/status/104250677051654144. Jon Huntsman, “Take It From Me: Obama’s Failed on Trade,” jon2012.com, August 22, 2011, http://www.jon2012.com/blog/Aug-22-2011/Take-It-Me-Obamas-Failed-Trade. Elise Jordan, “The World According to Huntsman,” National Review online, August 1, 2011, http://www.nationalreview.com/articles/273196/world-according-huntsman-elise-jordan. Jeff Zeleny, “Huntsman Criticizes Obama on Libya,” The Caucus, New York Times, May 20, 2011, http://thecaucus.blogs.nytimes.com/2011/05/20/huntsman-criticizes-obama-on-libya/. Jon Huntsman, “Palestinian Statehood Bid: Sign of a Larger Problem,” National Review online, September 22, 2011, http://www.nationalreview.com/corner/278089/palestinian-statehood-bid-sign-larger-problem-jon-huntsman#. Jake Suski, “National Security for the 21st Century,” jon2012.com, June 28, 2011, http://www.jon2012.com/blog/Jun-28-2011/National-Security-21st-Century.